(We’re still playing catch-up after the Albuquerque Comic Expo — please bear with us and we’ll be back to normal soon. Meanwhile, here’s another review I dug up from the archives). I think it’s safe to say that Forry Ackerman’s Famous Monsters of Filmland magazine and Don Dohler’s Cinemagic magazine were the two biggest influences on my young life — without ’em, I seriously doubt I’d be doing what I am today (whether that’s a good thing or not is up to someone else to decide). Both men passed away recently and I’ve been revisiting some of their work. I reviewed Dohler’s The Alien Factor and Fiend in my book, Unsafe on any Screen — his movies were goofy as hell but lots of fun to watch, and Nightbeast is no different. This time around, an extremely toothy alien crashlands in the little town from The Alien Factor (apparently a hotbed of alien activity) and for the next hour and a half we’re treated to some cheese-tastic action and bloodshed as many of the cast members from Factor return to battle this new creature. As usual, Sheriff Cinder wants to evacuate the town but Mayor Wicker (Richard Dyszel, a.k.a. horror host Count Gore DeVol) won’t hear of it — he’s planning an important pool party (!) for the visiting Governor and doesn’t want anything to interfere. Cinder goes ahead with his plan to evacuate, but that doesn’t stop the local lovelies from showing up to adorn the Mayor’s pool with their bikini-clad bodies. And speaking of bodies, while Cinder is doing his best to save the townsfolk, the Nightbeast is ripping the guts out of as many of them as possible. Not one to be outdone, tough-guy biker Drago (Don Leifert of Fiend) slaps around his girlfriend before strangling the unfortunate lass. The body is taken to the Medical Examiner’s office/dining room, where Cinder’s buddy Jamie (who was seeing the girl behind Drago’s back) gets all bent out of shape and roars off into the woods on his dirt bike to engage in a wild fistfight with Drago. Eventually, Sheriff Cinder falls down a short slope and hurts his leg. His female Deputy (whose direction seems to have consisted of the command “gaze wistfully into the air”) takes him back to her place and removes his pants to apply a bandage, then shucks her clothes. Cinder says “You’re a very attractive girl, Lisa — I guess I never really noticed before.” What follows is one of the most unsettling love scenes ever committed to film as she and Cinder get it on — it’s like stumbling across an old Super-8 loop of your aunt and uncle going at it. With the lovin’ out of the way, all roads lead to action as Cinder and his team of alien-fighters devise a plan to destroy the Nightbeast, which is interrupted when Drago shows up in an oddly-torn t-shirt that looks like something from the fat guy’s section of the Frederick’s of Hollywood catalog. The gang makes short work of Drago (after a reasonably unpleasant sequence wherein he roughs up our lovely Deputy) and heads off for the final battle with the hungry creature, wherein sacrifices are made and blood is spilled. 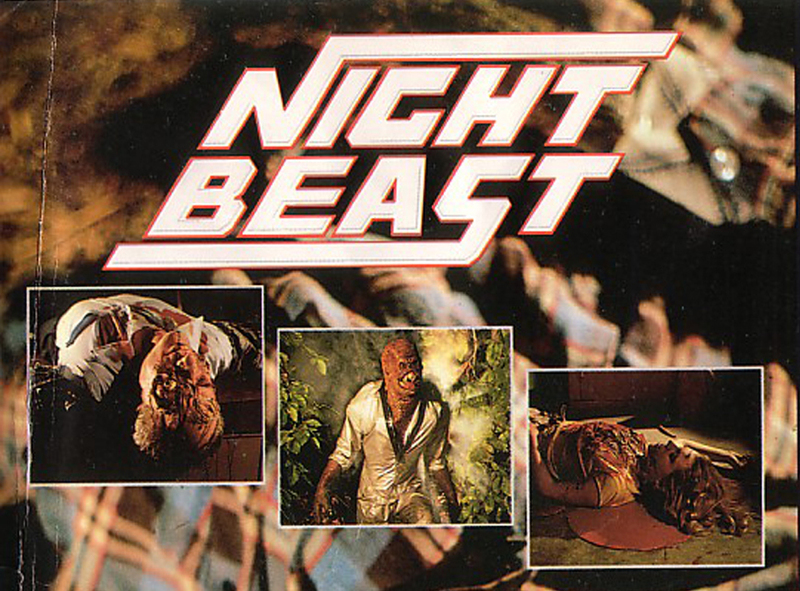 Nightbeast definitely makes for some entertaining viewing, and I highly recommend it, along with Dohler’s other movies.